Refrigerant Tools Reliability Direct, Inc. Your Direct Source for Reliability, Maintenance, Test & Measurement! Find the tools you need to detect refrigerant leaks in residential and industrial appliances. The perfect addition to any HVAC/R technician's tool kit, and a necessity when installing, maintaining and repairing refrigerators, freezers, air conditioners and more. The Affordable, Portable Leak Detector. 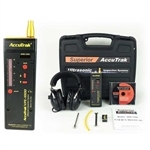 Moderately priced, portable leak detector with proven heated-diode sensor technology. The electrochemical heated- diode sensor resists dirt, water, oil, and other contaminants offering exceptional resistance to the effects of contamination. Equal sensitivity to CFCs, HCFCs, and HFCs eliminates resetting or switching for different refrigerants. The automatic background compensation feature continuously monitors and automatically compensates for changing background "noise" without the need for manual adjustments by the operator. Detect and pinpoint even small leaks of refrigerant gases using the Model RLD1 Refrigerant Leak Detector. Effective in detecting existing refrigerants including HFC, HCFC, CFC, SF6, R134a, and R123. Unit features thumbwheel operation to increase sensitivity and audio and visual indication. The flexible gooseneck probe is ideal for hard to reach areas.